Is it too early to start thinking about Spring? I know we’re still in the middle of Winter right now, but it hasn’t been too horrible this year and who knows what news the groundhog will have for us this Thursday (Groundhog Day is February 2nd). At Pyramid Brewing they’ve been doing a bit more than just thinking about Spring and earlier this month they announced the release of their Spring seasonal, Triangulate Citrus Pale Ale. Dry hopped with Lemondrop™ hops and real lemon peel, Triangulate brings us Spring a bit early this year. SEATTLE (January, 2017) – Pyramid Breweries today announced the release of its spring seasonal, Triangulate Citrus Pale Ale, which hits shelves in mid-January. This refreshing new brew is dry-hopped with Lemondrop™ hops and real lemon peel for a big, citrusy nose and flavor. Triangulate Citrus Pale Ale’s three hops sharpen the citrusy flavor and aroma, while a trio of malts and grains create a smooth, full body. With a huge helping of Lemondrop™ hops and real lemon peel, the accompanying Apollo and Cascade hops produce an additional layer of complexity to the seasonal pale ale. Wheat and oats take the malt body in a unique direction for a satisfying mouth-feel. This month, Pyramid Breweries also unveils the limited time Brewer’s Reserve Railroad Avenue, which will be available mid-January to late April. 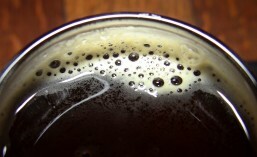 This Imperial Porter uses deep roasted malts and roasted barley with dashes of vanilla, cinnamon and dark brown sugar. Railroad Avenue is a big, malty brew that conducts the palate to a nicely spiced, mildly sweet finish. Spring in the Pacific Northwest is enchanting as snow thaws and daylight lengthens. Whether a day-hike, baseball spring training, or scenic road trip, Triangulate Citrus Pale Ale is the perfect seasonal brew to welcome spring adventure. For more up-to-date news and events, follow Pyramid Breweries on Facebook, Instagram and Twitter at @pyramidbrew. Based in the Pacific Northwest, Pyramid Breweries began as Hart Brewing in 1984 with the flagship brand of Pyramid Ales. In 1996, the company was reborn as Pyramid Breweries and currently offers craft beers produced under the Pyramid family of ales and lagers. With breweries and Alehouses in Seattle and Portland, Ore., Pyramid has earned 17 medals at the Great American Beer Festival (GABF), including the honor of Mid-size Brewery of the Year in 2008. The brewery also has been awarded seven medals in international competition at the World Beer Cup. For more information visit, www.pyramidbrew.com. Both Triangulate Citrus Pale Ale and Brewer’s Reserve Railroad Avenue are available now from Pyramid Brewing. Drop by the brewery to pick some up, or look for bottles at your local craft beer retailer. Both beers will be available now through April. This entry was posted in Ale, Beer, Beer Ingredients, Beer Labels, Beer Release, Bottle Shops, Bottling, Branding, Brewing, Craft Brewery, Distribution, Draft, Dry Hopped, Hops, Imperial, Local, New Release, On Tap, Pale Ale, Porter, Pubs, Retail Product, Seasonals, Seattle, Series, SoDo, Taproom, Washington, Washington Beer, Winter and tagged 2017, beer, Beer Release, January, Pyramid Brewing, seattle, SoDo, Spring, Winter. Bookmark the permalink.